Hi I have created my form and tested. All seemed fine but now I am getting quite a few people saying that either the submit button is not appearing or the bottom half of the form is getting cut off. This only appears to be happening on Ios devices. Ie; Iphone and Ipads. Is there still an issue with what browser you are using on your device or has this been sorted now that the forms should be compatable with safari? I have read a few other threads with similar problems and wondered if there was a fix for it yet? Thank you for contacting us. It should be compatible with IOS devices as I know the form was design to match the mobile devices like IOS and android. Your form looks fine on my end. 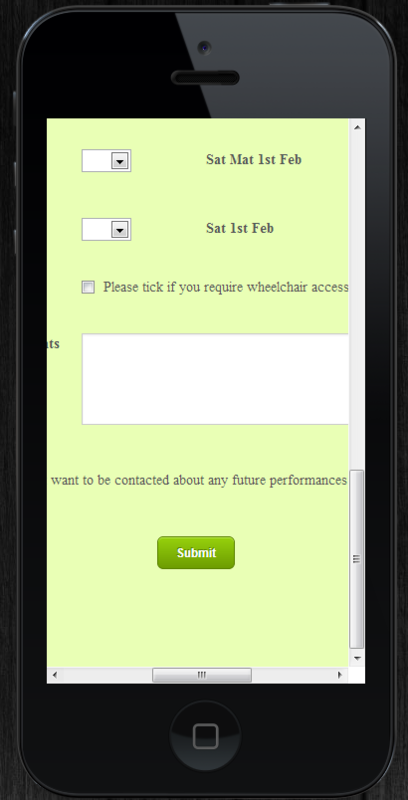 I made a test using an online emulator for Iphone and I can see the submit button. If you can get a screenshot of the form and how it looks on a device you can follow this guide on how to attach an image https://www.jotform.com/answers/277033.